Work Order Management | Scout Inc. Managing work orders is an important aspect of many companies work flow process. It is important to get key information, but also to have a user friendly process for your employees to effectivly complete the work order. Work order management in topShelf is powerful and very easy to use. Using our mobile barcode scanner in your warehouse, or a smartphone for employees out on jobs, you can track the status of a work order from assigned, to in progress, to completed. You can also track labor hours in order to correctly bill your customers for the hours needed to complete the work order. 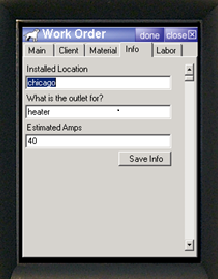 Our application allows you to assign parts to the work order, and deduct the actual parts used to complete it. Additionally, custom fields allow you to track things specific to your businesses needs. topShelf brings you the latest technologies, and allows you to automate your work-flow process. We would be happy to show you more in a web demonstration, click this link and fill in your information and a scout representative will get in contact with you. Why wait, your work order management solution is here with topShelf from Scout. Managing work orders is an important aspect of many companies work flow process. It is important to get key information, but also to have a user friendly process for your employees to effectively complete the work order. Work order management in topShelf is powerful and very easy to use. Using our mobile barcode scanner in your warehouse, or a smartphone for employees out on jobs, you can track the status of a work order from assigned, to in progress, to completed. You can also track labor hours in order to correctly bill your customers for the hours needed to complete the work order. Our application allows you to assign parts to the work order, and deduct the actual parts used to complete it. Additionally, custom fields allow you to track things specific to your businesses needs. topShelf brings you the latest technologies, and allows you to automate your work-flow process. We would be happy to show you more in a web demonstration, click this link and fill in your information and a scout representative will get in contact with you. Why wait, your work order management solution is here with topShelf from Scout.